San Francisco, CA – April 5, 2018 – FAST USA, the Facility for Advanced Sailing and Technology, has opened at Treasure Island Sailing Center (TISC). 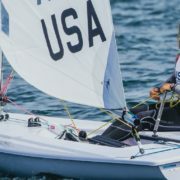 FAST USA combines the resources of a three-way partnership between TISC, the St. Francis Sailing Foundation, and US Sailing, the sport’s national governing body. The partnership will enhance the community-based activities of TISC and create a flagship training base for the US Sailing Team of unprecedented scope and technological sophistication. The FAST USA concept caps a 20-year effort from TISC to bring novice and Olympic sailors together in the same Bay Area training facility. The program will create a legacy of opportunity, mentorship, and excellence in sailing. TISC and the St. Francis Sailing Foundation have worked together on existing community sailing programs including the highly successful Set Sail Learn program for San Francisco public school 4th graders. “We are thrilled about this new partnership and what it means for kids in our community. Whether they join the Youth Racing Team, train to be a coach or teacher, or intern at a technology lab, there will be opportunities for them to become leaders in the sport of sailing,” said Carisa Harris, President of TISC. 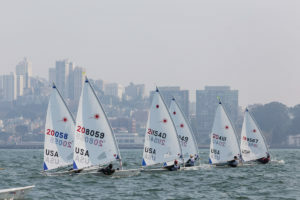 To highlight the launch of FAST USA, US Sailing has designated Treasure Island Sailing Center as one of the primary national training centers for the US Sailing Team. Forming the centerpiece of the new Olympic-level facility will be an extensive container-based structure that previously served as an America’s Cup team base and was donated to US Sailing in 2017. US Sailing selected TISC as the new home for this cutting-edge facility as well as several top national team coaches and staff. With technology playing an increasingly critical role in high-end athletics, FAST USA places America’s top sailing talent at the hub of US high-tech research and development. The Bay Area offers proximity to outstanding institutions of higher education and an ethos of innovation. The US Sailing Team’s technical staff will have access to an unprecedented breadth of technical solutions that will propel American sailors to medal-winning results. 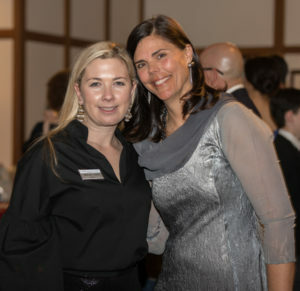 A heartfelt thank you to everyone who came out to support the recent St. Francis Sailing Foundation Auction. Over $250,000 was raised, funds which will be used to support “puddles to podium” sailing. 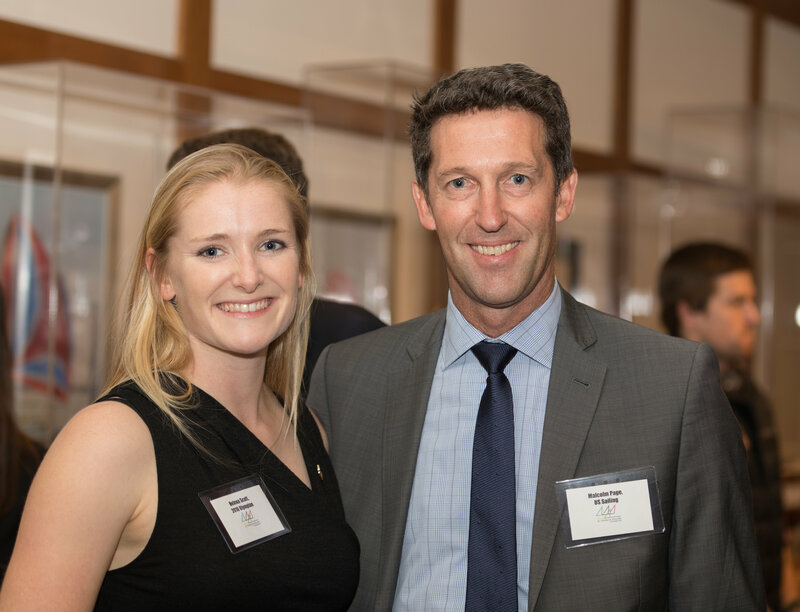 Auction emcees Jim Cascino and Paul Cayard livened up the party with their bantering and tall stories, while Olympian Helena Scutt did not leave a dry eye in the room after sharing her story of climbing her way to sailing’s pinnacle. Our sights are set on gold! Thanks to Auction Chair Michelle Harris (left) & her committee for all their hard work! The St Francis Sailing Foundation would like to congratulate Riley Gibbs (Nacra 17), Caleb Paine (Finn), Paige Railey (Laser Radial), Erika Reineke (Laser Radial), and Helena Scutt (Nacra 17) on being named to the 2018 US Sailing Team. We wish them all the best in their endeavors this year, and beyond! The St Francis Sailing Foundation was proud to be a co-supporter of the Dave Perry Youth Match Racing Clinic recently held at the San Francisco Yacht Club. 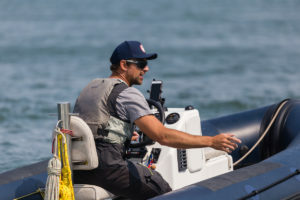 Perry, who is Vice Chairman of the US Match Racing Committee, covered tactics and strategies to be competitive and successful in match racing on the National Level. 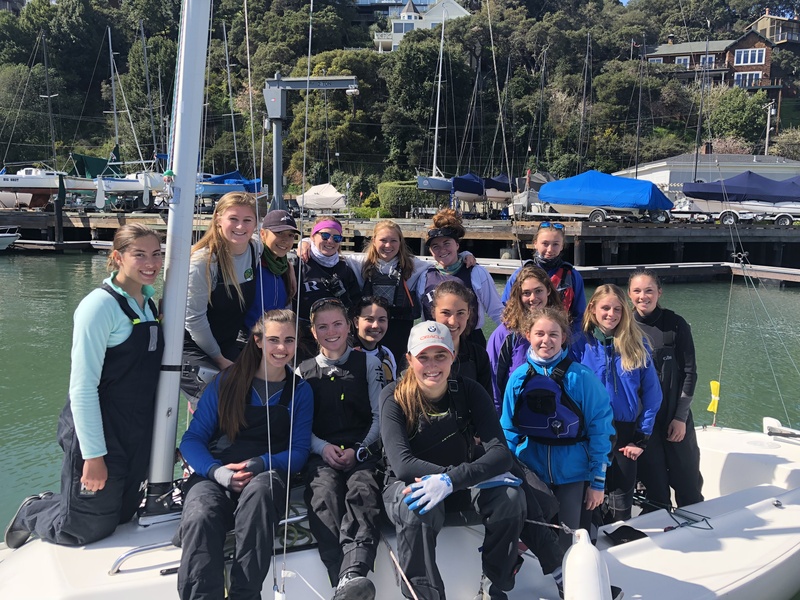 The Clinic, which was sailed in J/22s, was attended by some 24 Bay Area youth sailors including Chloe Holder, Sarah Cuyler, Mats Keldsen and Mackenzie Berwick who share some of the lessons learned from a great weekend of race training. Chloe Holder: Learning from Dave was an incredible experience. He knows a ton about match racing, so we all wanted to absorb as much knowledge as possible. It was a new type of sailing for most us, so there was a lot to be learned. The meetings were packed with information, and he made a lot of jokes to keep us involved and actively participating. I learned a ton about the most effective way to make it to the line on time and prevent the other boat from making it, as well as what to do off the start. We talked about boat speed and how to make the boat go as fast as possible, sail trim and having the proper amount of heel. We touched on how the rules change from fleet racing to match racing, like how to head people up when we get overlapped rather than having to let the windward boat sail their proper course. My understanding of the rules and tricks of match racing has increased dramatically. In the mornings we learned off the water and during this time were encouraged to engage with our peers. This gave me the chance to get to know the other sailors and understand technical maneuvers which I could then apply on the water. We spent much of the day sailing which allowed us to apply our knowledge and get a feel for the boat, our competitors, and how to navigate the course well. Through adverse weather conditions, we managed to sail and learn and grow every hour. Afterward, we reviewed footage of our maneuvers and discussed how we could improve. This was my favorite time as I was able to see clearly what I needed to work on. I want to personally thank the San Francisco Yacht Club for hosting this event, and Dave for his unending love of sailing and coaching. I had an incredible weekend and would jump at the chance to do it again. I had previously sailed in a clinic run by Dave and I was reintroduced to his style of coaching. Even in the light air that Sunday presented us with, Dave continued to run races and made the most of the tactics that he had imparted upon us during the previous days. Personally, it was an opportunity to practice light wind starts and accelerations, and I was satisfied with the knowledge I had gained, which allowed me to confidently navigate the pre-start(s). My team, who had little experience in match racing, were able to take a step back and slow down from the agile dinghies they were used to. Match racing was a new and fun way to sail, and Dave taught us how to do that at a high level. The clinic was a wonderful opportunity to learn about match racing. Through detailed video review, tactical advice, and plenty of drills, we all improved quickly. The conditions were fair. We got to try our skills in heavier breeze on Saturday and lighter air on Sunday. Thanks to the hard work of the SFYC staff, the support of the St. Francis Sailing Foundation, and the leadership and knowledge of Dave, our team had lots of fun and made big improvements. The support and attention given to the Bay Area Youth sailors has been outstanding and encouraging. We look forward to future clinics and regattas! 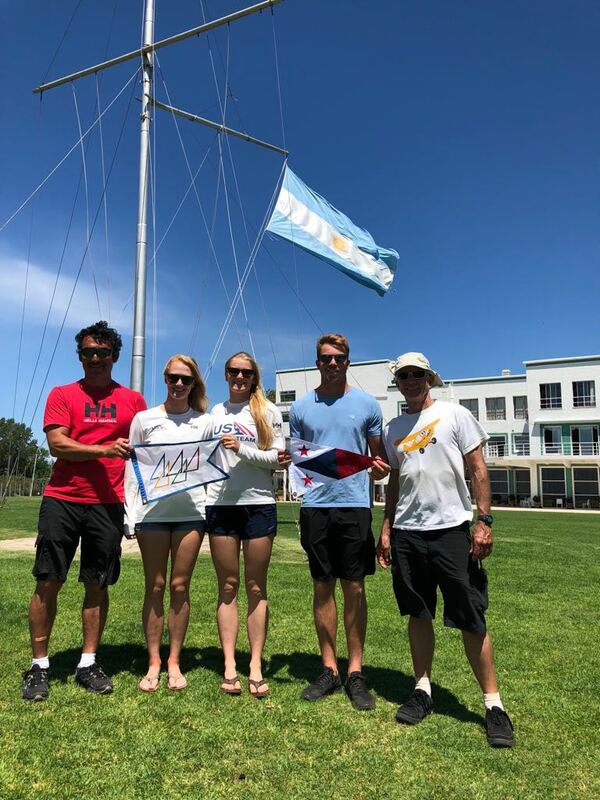 A week and a half after the Sailing World Cup Miami wrapped up, Helena Scutt and her skipper Bora Gulari, together with Riley Gibbs and Louisa Chafee were on a plane from Miami to Buenos Aires, Argentina. After a busy month of January in Miami, they were ready for a new venue, and of course with that came a new culture too. Here, Helena shares experiences from Argentina. 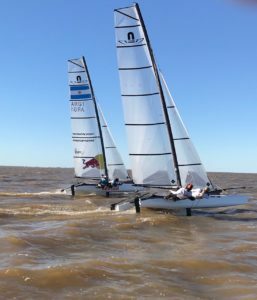 The Rio 2016 gold medalists in the Nacra 17, Santi Lange and Cecilia Carranza, invited us to train with them at Santi’s yacht club in Buenos Aires, Argentina, called Club Nautico San Isidro (CNSI). The yacht club is a beautiful and enormous institution with 13,000 members! The surrounding area feels like a giant Tinsley Island. There are canals everywhere full of sailboats on boat sides. In fact, we commuted by coach boat from our rental house! CNSI was the host of the 2015 49er & 49erFX World Championships which I competed in, so it was not my first time there, but it is so different from home that it felt just as novel to me as it was new to Bora, Riley and Louisa. The best part is how many sail boats were out cruising every day (there are virtually no motorboats), enjoying the Rio de la Plata. El Rio looks like chocolate milk, it’s brown from the sediment carried thousands of miles from Brazil, Bolivia and Paraguay. It’s the widest river in the world and only 2m deep! Conditions changed gradually each day, allowing us to get distinct morning and evening sessions. Since the river is so shallow and can have strong current in either direction (it can be very wind driven), the chop can really stack up close together. This makes for challenging downwind foiling in the Nacra 17. Performance depends on dynamic weight movement fore and aft, in and out, and of course precise spinnaker and mainsheet trim. Every movement and change must be anticipated, otherwise you’re already late. Foiling gybes are becoming more consistent for us, and through lots of short-course practice racing we are forced to make fast decisions in a fast boat even faster. The main lesson for us, aside from our technique and sail/foil setup improvements, came from Santi and Ceci – their energy towards sailing. Every time they step onto their Nacra, from pushing off the ramp to returning into the basin, they are sailing with an intensity like their life depends on it. An Olympic campaign can be a long road with lots of travel, long days, and seemingly tedious details. But as gold medalists (and three-time medalist, in Santi’s case), they know that purposeful practice is all that matters at the end of the day. We are grateful to have them as role models, friends, training partners, and competitors. After training one evening we enjoyed a traditional Argentinean barbecue (asado) and another evening we went to a local soccer match where the fans didn’t stop jumping and singing for the whole game. Besides that, we were training so much that we didn’t have the chance to explore the area much at all, but we hope to return for longer in the future. The container with our boats will go from Buenos Aires to … San Francisco! We look forward to using these boats on the Bay in May before they head to the 2020 Olympic venue in Japan for two events in September. Next on the calendar is kicking off the European season. Riley and Louisa will race at Palma and then we’ll join them and Santi & Ceci for training in Barcelona and then the Sailing World Cup Hyeres. We’d like to thank the St Francis Sailing Foundation for their generous and consistent support of both of our campaigns. Both Gulari/Scutt and Gibbs/Chafee teams believe in the US Sailing Team’s vision, that working together will ultimately lead to a better USA result in Tokyo 2020, and that’s what it’s all about. Follow our journey to 2020 at facebook.com/gulariscuttracing. 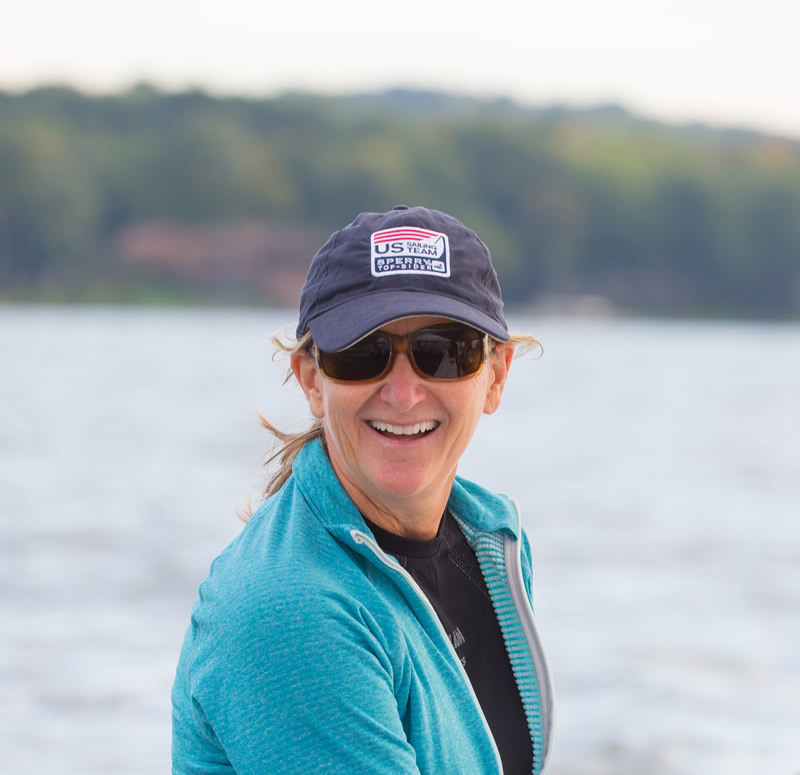 St Francis Sailing Foundation caught up with JJ Fetter, Foundation advisor and two-time Women’s 470 Olympic Medalist, recently back from the US Sailing Leadership Forum in St. Pete Beach, Florida. Here she shares highlights from the Forum, as well as her thoughts on getting kids into the sport…and keeping them engaged. Was there one particular topic at the Forum which received a lot of attention? JJ: I thought one of the big topics that seemed to get a lot of buzz was the fact that we were celebrating 30 years of women in Olympic sailing, which was super fun on a personal level. 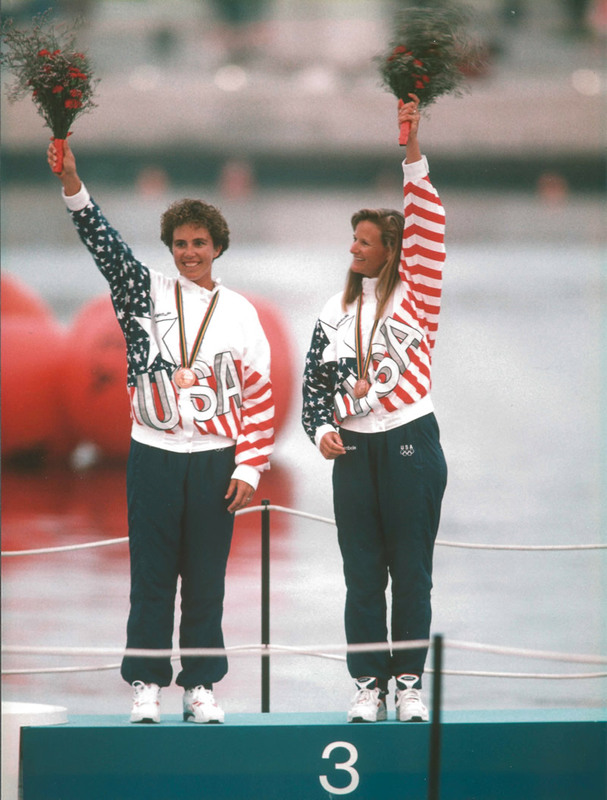 I got to see some of my former competitors like Allison Jolly and Lynne Jewell (the pair won gold in the 470 at the ’88 Summer Olympics in Korea and the only American sailors, male or female, to win a gold medal at the Games. I also caught up with Pam Healy who I went to the Games with in 1992, as well as Kris Stookey and Louise Van Voorhis (who represented the US in the ‘96 Games in the 470), so it was really fun to catch up with old friends. Cory Sertl (alternate on the ’88 Olympic team and vice president of US Sailing), who was also part of that group of women who were training and competing against each other in 1992, organized a really cool thread that ran throughout the Forum focusing on women, like the Women in Sailing Leadership Session. Pam was on that panel with Cory, Lynn Handy and Amanda Callahan. The session was standing-room only with a good percentage of men attending! It definitely seemed to be a topic people were talking about in the hallways and at the cocktail parties. How was the subject of participation in sailing addressed? JJ: The great thing about the Leadership Forum, I think, is that it is evolving into a forum where organizations with creative programming are bringing ideas and solutions to some of the issues in our sport, like participation. The US Sailing leadership is doing a good job of identifying those program directors and coaches and bringing them to the group. The sessions were all very collaborative where people were encouraged to share things their organization has tried, shared contact information etc. There was a lot of talk about how junior programs have equal numbers of boys and girls up to a certain age, then girls’ participation really drops off. 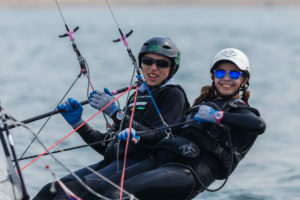 Some stories that were shared indicated that girls want a more social sailing environment and team aspect at a younger age so maybe less inclined to go the solo Opti route – they would rather have a double-handed boat introduced earlier so they can stay with their buddy. When you take a good hard look at the high school and college programs, the fact is that many times there are unequal opportunities for tall athletic bigger girls in those programs unless they want to sail a Laser Radial. It would be great to expose those girls to trapeze dinghies. Showing those girls a very cool high-performance boat is one of the great things that the St Francis Sailing Foundation is doing with its supported clinics. The Foundation is leading by example in supporting female Olympic aspirants. It provided crucial support to many of our female US Olympians at the Rio Games including Marion Lepert, Helena Scutt, Briana Provancha and Paige Railey. And, it is identifying and supporting the next generation of talent — the 2016 Rolex Yachtswomen of the Year, Daniela Moroz, and the 2017 recipient Erika Reineke are both Foundation grantees. What kind of youth programming do you think should be available? JJ: In our youth discussions it was addressed that we need to be careful in programs that try to do a one-size-fits-all approach. There will be the kids who want to go the high-performance route, those who will want to do the adventure sailing route, others who want to sail the round-robin tactical kind of boats, and kids who want to be the next Charlie Enright and go around the world. We need to make sure the kids are exposed to all those aspects of our sport and are building the skills at age-appropriate stages so that they can go wherever they want – kiteboard, cruising, racing, whatever. I embrace the fact that our sport has all these different avenues. Additionally, an important challenge for the future of our sport will be to expand and include a more diverse population. One important solution is to increase access through community sailing programs. 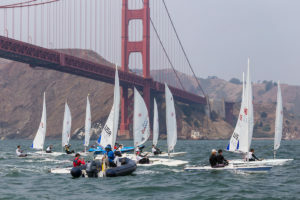 St Francis Sailing Foundation is taking a leadership role here by supporting programs at the Treasure Island Sailing Center in San Francisco, like “Set, Sail, Learn”. Last year, the program introduced sailing to over 1,500 fourth-graders from the public school system. A large percentage of the kids are Hispanic, and many come back for the two-week summer course. The Foundation is providing scholarships to 80% of those kids. Do you think it is more complicated today for kids to put their “everything” into the sport? JJ: Kids are getting pulled in so many different directions and an Olympic campaign for example, has become such a full-time professional endeavor in a way that it wasn’t back in my day. And I’ve seen that at every stage. When I was sailing varsity in college and recall the amount that we practiced, the kids in my junior program now practice as many times a week as we did, and college kids are practicing as hard as many hours a week and training in the gym many hours as I did for my first Olympic campaign! Everything is just ramped up exponentially. I think the Olympic path – and I know I am biased – is so rewarding. There is truly nothing like competing against the top sailors in the world at a regatta where all competitors are at the peak of that sport. When you are on that starting line at the Olympics, every competitor knows what the other has sacrificed for that goal. The respect that you have for your competitors, the respect they have for you and putting it all on the line in a regatta where there’s no “do-over”, it’s an amazing experience. 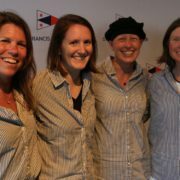 And, it’s so cool to know that right now, half of our US Sailing Team squad is female! 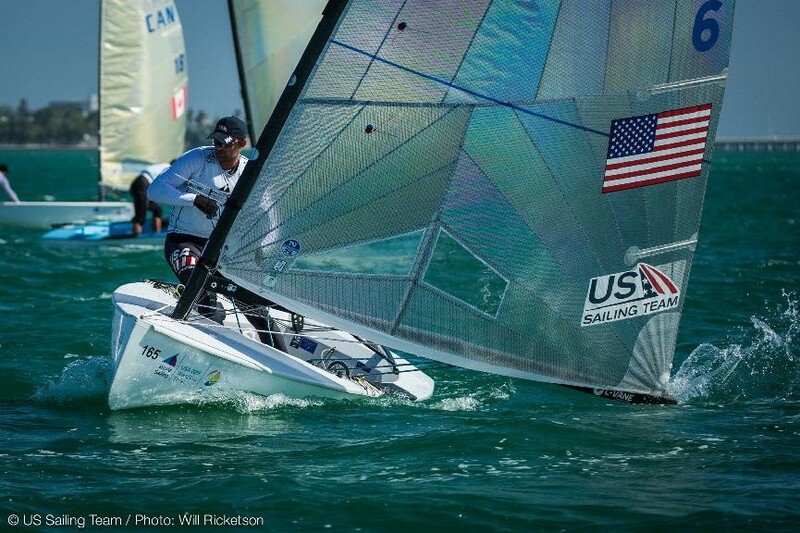 Where should the focus be to improve US sailing success at the highest level? JJ: Living in Southern California, I am super excited that LA is going to host the 2028 Olympics – Long Beach is a great place to sail. When the Olympics were here in 1984, the US won silver or gold in every event and to me, that is the goal we should be working toward – thinking about what we can do to get the US back on the podium in every class by then. A well-integrated training center is important to that end. A key part of developing Olympic sailors is to keep inspiring the kids and exposing younger sailors to cool, fun high-performance boats and let them experience how fun it is to sail a planing dinghy or trapeze on a 29er or Nacra, and to try windsurfing. As the late, great Bob Billingham would say, “Plant a lot of little seeds”, to see which sailors are willing to put in the work and have the passion to develop their skills. Pam Healy is doing an amazing job of organizing clinics that plant those seeds. We also need our sailors to put more time in on the water but for that to happen, we need to give the sailors the resources they deserve as professional sailors. Everyone needs to get out their check books and support Olympic sailing, support their local campaigners and regional programs that are supporting Olympic sailors and US Sailing’s Olympic program! A year and a half ago, with the majestic hills of Rio de Janeiro as a backdrop, Caleb Paine (San Diego, Calif.) proved that he’s not afraid of sporting’s bright lights, claiming the Finn class bronze medal in the Rio 2016 Olympics with a stirring win in the Medal Race. 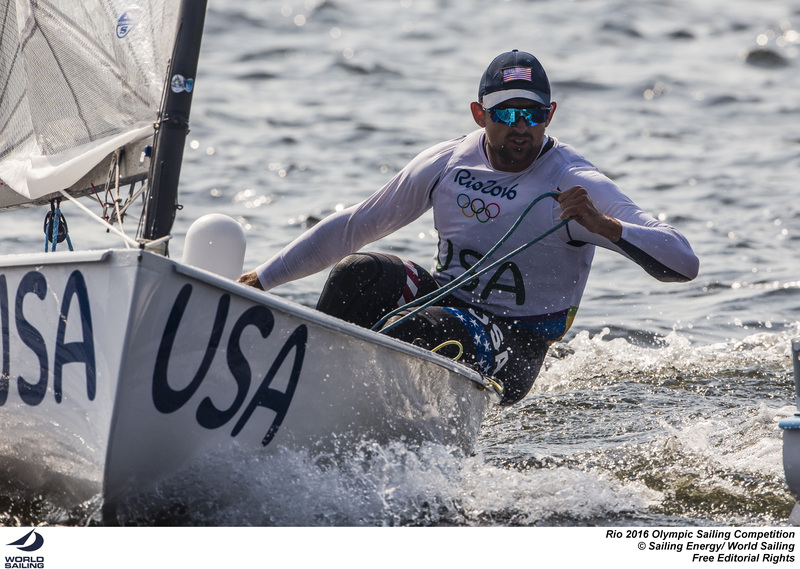 Earlier today, on Biscayne Bay, Paine came up big again when the pressure was its most intense, earning the Finn silver medal in the 2018 World Cup Series Miami, USA. Paine started the Medal Race needing to place one boat between himself and Alican Kaynar (TUR) to move from third to second in the overall standings, while also not letting Ioannis Mitakis (GRE) finish too far ahead. Giles Scott (GBR), the reigning Olympic gold medalist, had simply to finish the race to ensure himself of the gold medal. Without a doubt, a 2017 highlight for experienced youth sailors was the first regionally-focused Olympic Development Heavy Weather Clinic held in September and hosted by the St Francis Yacht Club (with the support of the St. Francis Sailing Foundation and the Belvedere Cove Foundation). 40 youth sailors ages 15-20 from around the country attended the 3-day camp. Significantly, it was first time that US Sailing extended participation in its training camps to local regional programs. The goal was to have ODP coaches and sailors work alongside the local sailors and coaches to encourage collaboration and knowledge sharing on both levels. 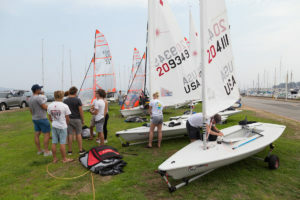 Participants were on the water from 10-2pm daily sailing 29ers, Lasers and Nacras, followed by a debrief. Coaches included Grant Spanhake, Kevin Hall, David Liebenberg, Dane Wilson, Caleb Paine, Mark Andrews and Pete Melvin. 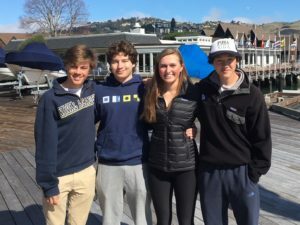 Here, San Francisco Bay Area sailors Jack Sutter, Charlotte Versavel, Will Glasson and Chloe Holder reflect on their experience. 15-year old Jack Sutter from Benecia, Calif., is a member of the St FYC and RYC. He’s a sophomore at St. Patrick-St Vincent High School. Jack sailed the clinic in the Nacra 15 with crew Charlotte Versavel. 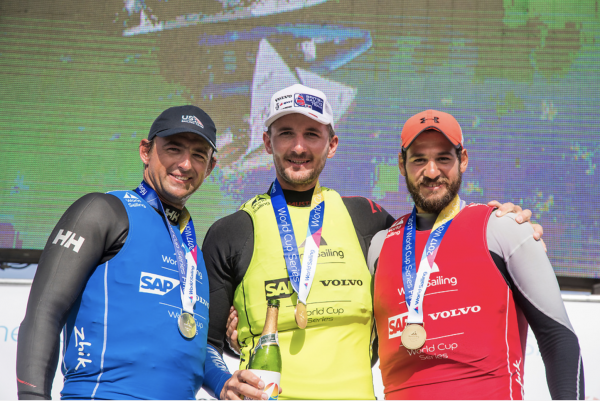 “Our coaches, Leandro Spina and Pete Melvin (designer of the Nacra) were always helpful and we learned so much from them. The boat is very new and there are many different ways to sail it. It’s exciting to sail a new boat design where you are allowed to discover new techniques and the fastest way to sail the boat. The coaches helped us refine our upwind and downwind sailing as well as tuning and adjusting the boat for its best performance. The boat has so many ways to depower and we learned all about it in very descriptive powerpoint presentations and morning meetings. 14-year old Charlotte Versavel from Palo Alto, Calif., is a member of the St. FYC and RYC, and a 9th grader at Palo Alto High School. Prior to the ODP Clinic, she and Jack practiced every weekend for over a month out of St. FYC, and were excited to compare their boat speed and maneuvers to the rest of the Nacra 15 fleet. The pair are aiming to represent St. FYC and the United States at the 2018 Youth Olympics in Buenos Aires. “We were happy to find that our maneuvers were overall much better than most of the teams, and that our upwind boat speed was also really good. Downwind, Jack and I were unbeatable, which was awesome, especially considering the amount of time we have been sailing together, and the experience we have as a team. By observing the other teams, Jack and I figured out how to improve our accelerations a lot. We also learned that we will need to work more on our racing skills. The coaches, especially Pete, Fuzz, Adam, and Leandro, were really helpful, answering and explaining our questions and encouraging us to try new things on and off the water. 16-year old Chloe Holder is from San Anselmo, Calif., and is a junior at Redwood High School. She’s been sailing since she was 9 and currently sails out of St. FYC. She is looking forward to participating in college sailing in the future, so the clinic was an awesome opportunity for her. “It was probably the best decision I have made in my sailing career as it has opened up so many more opportunities. Since then I have attended CISA and competed in Midwinters West, US nationals, and 29er Worlds. The ODP Clinic was my first time sailing with my new partner, which faced us with many challenges such as communication, timing, and defining roles, all of which we improved greatly over the weekend with the help of all the great coaching we were receiving. By the end of the weekend, we were pretty much able to keep up with the rest of the group which was extremely rewarding. Two-time World Champion Daniela Moroz talks about her recent sweep of the Oman Formula Kite World Championships. From race 1, Moroz had the outcome dialed, winning with a 27-point lead over Elena Kalinina (Russia) in second. 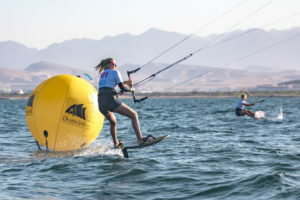 Per the International Kiteboarding Association point system, Moroz was ranked third going into the Worlds because she didn’t attend as many IKA events as the other women competitors and so received more points than those women. Unofficially however, she was ranked first since she’d won every foiling event she competed in this year. Was there anything specific you were focused on to reach the level you needed to be for the Worlds? DM: It’s hard to point out one specific strength since I feel like I’ve become pretty well-rounded. I trained a lot over the summer, and tried to get some time in light wind conditions, which were my weakness last year. Improving my light wind skills was definitely a focus for me this year. Once school started at the end of August, I didn’t have as many opportunities to really train on the water outside of events, so I tried to make up for that by going to the gym and swim practice, and really paying attention to what I was eating. Going into this event, I knew there would be A LOT of expectations of me. I knew that everyone was expecting me to win. Personally, I hate having expectations for myself because it is so disappointing if you don’t do what you expected to. But I knew that everyone expected me to win. It was difficult to tune all of that out at first, especially traveling to Oman for the event. On the training day, I was pretty stressed out but as soon as racing started, something just kind of clicked and I didn’t worry about the different possibilities. I just focused on what I had to do, race by race. It worked out pretty well in the end – haha! What did you feel you were particularly strong at? DM: One of my strengths was being able to mentally tune out all those expectations and just focus on myself and my race, one by one. Physically, racing in strong wind is a big strength for me, being from San Francisco. However, I also think something that I really improved on this year was understanding my gear and especially knowing how to adjust my kites. Last year, I was brand new to it and was honestly afraid of doing it on my own. I always had one of my teammates help me out with it. But this time I felt a lot more confident about it. For example, on the last training day before racing began, I went out on a kite that I had not spent too much time on, and it did not feel the way I normally like. I felt much more confident about coming in and adjusting the knots to the way I felt would be better. It’s something minor, but it made a big difference – that kite, an 11m, ended up being PERFECT on the windy day and it definitely made me trust my own judgement more. How were the conditions and were they favorable for you? DM: We had a variety of conditions throughout the week. I think that’s the best kind of event because that way only the true best people can win because they have to be good in everything. We raced in everything from 6 knots on the morning of the first day and last day to around 22-25 on the second day to 10-13 on the days in between. I used almost every kite I registered. How did the competition compare this year to last? Who were you looking out for and why? DM: I think the overall level of the women’s fleet has improved a lot. Elena Kalinina, from Russia, is really strong in light wind, as I saw at the Worlds last year. I was definitely looking out for her when it was light. Alexia Fancelli from France has improved a lot over this season, and I was surprised at her speed when it was windier. I felt like I kind of knew most of the girls’ strengths and weaknesses, but I mostly just tried to focus on myself and my own race. It seems like for the most part you were strong from the get-go – what were the defining moments of the competition? DM: I felt pretty good after the first day, winning all but one race. I just tried to be consistent and sail clean. The second day was the windy day when we were on 11m’s, and I loved those conditions. I think my defining moment was after the second day. I had won 10 out of the 12 races we’d done so far and it gave me a lot of confidence going into the rest of the week. What equipment were you on? DM: Ozone R1 V2’s and Mike’sLab board and foil. What’s next for a two-time World Champion???? DM: I HAVE to focus on finishing junior year! It’s a tough year, so I really want to just keep my grades up. Other than that, I love what I’m doing and I’m gonna go for #3 next year!